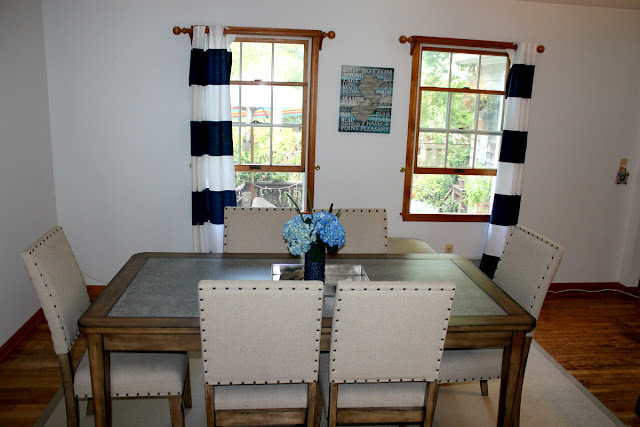 If you are a regular reader here at Pieces of a Mom, you are aware that I partnered with Raymour & Flanigan a few months ago to make over our dining room. I had heard nothing but positive feedback from friends who had previously purchased from Raymour & Flanigan, and I was absolutely thrilled to have an opportunity to collaborate on a room makover. 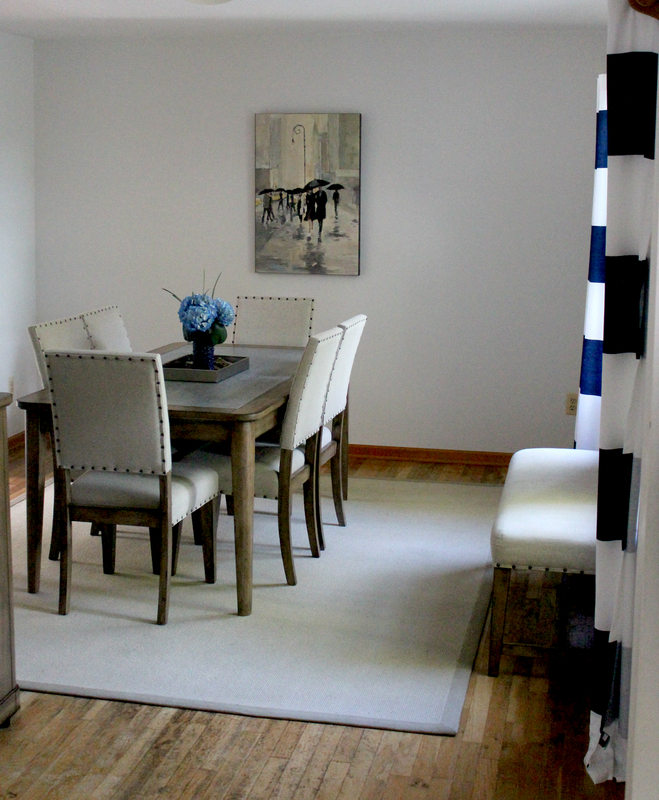 Our dining room was anything but a dining room. It was a playroom, an office, a TV room, an entertainment area, and a closet of sorts. Last week, I shared a few before pictures of the room so that you can get an idea of just how badly this room needed the ultimate makeover. 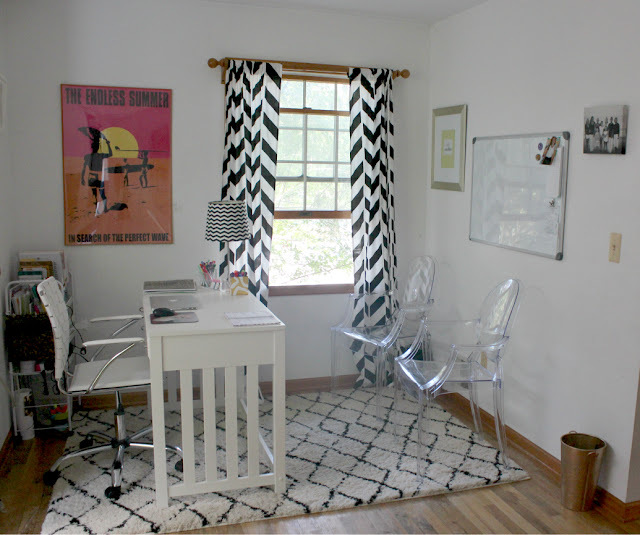 We had a lot of ideas for what we wanted the room to look like and the kind of furniture we wanted. Our home is casual chic, so we definitely didn't want a dining set that was too formal. Since the room is not incredibly large, we didn't have space for more than a few pieces of furniture including the table and chairs. I wanted fabric chairs, but the Hubs thought wood chairs were more practical for a family with 2 young daughters. I wanted the room to look cozy and comfortable not hard. We also really wanted seating in the form of a bench to accommodate more people than chairs could. Raymour & Flanigan offers several sets that met our criteria. We headed to the showroom to get a look up close and personal. The decision was A LOT harder than I anticipated. I was torn between several sets, but in the end, we went with our first choice: Gray Street 6-piece dining set with a bench. It is the best fit for this room and for our needs. Take a look. The set came with the bench, but we purchased two extra chairs in the event that we opt to not use the bench. 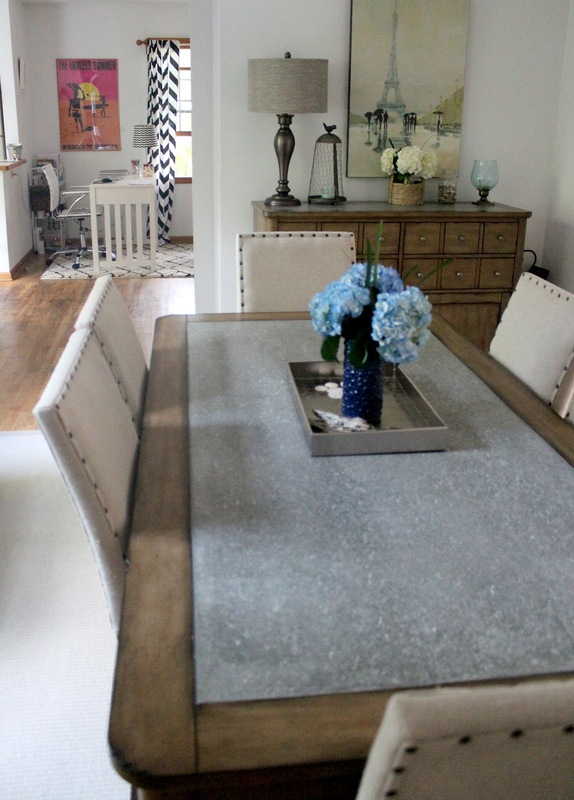 I loved the nail head accents on the chairs and the concrete tabletop inlay. The concrete inlay is unique, and I had never seen a table like this before. Raymour & Flanigan has an amazing selection of wall art including canvas prints like the rainy day scene from Paris above. Whether you are looking for framed prints, canvas prints, mirrors, or clocks, Raymour & Flanigan can bring your walls to life. 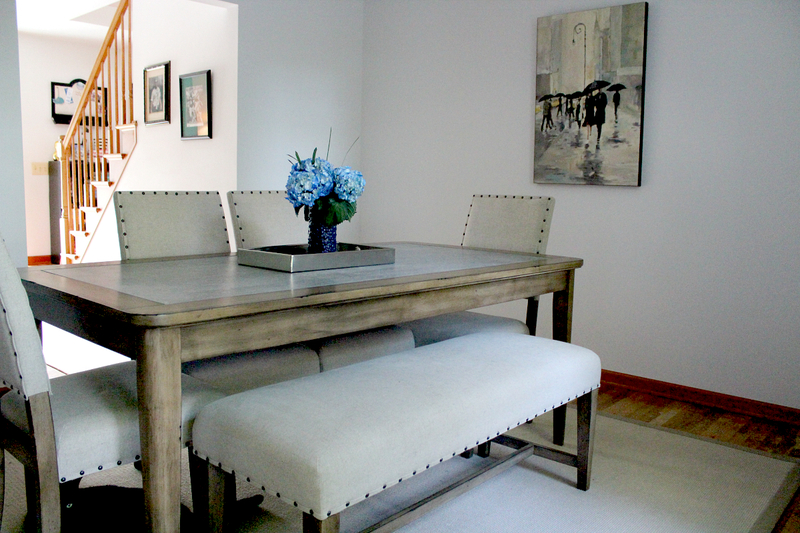 When we aren't using the bench, we place it along the way in the dining room. 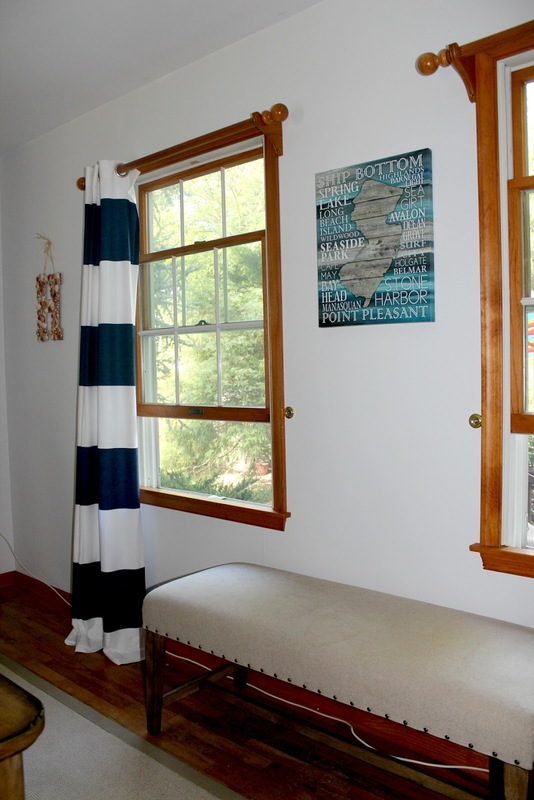 We replaced our curtains to give the room a more beachy, casual feel. We wanted a buffet server rather than a hutch since it's less formal than a hutch. I don't have a formal china set that I need to display, so a hutch was not a requirement on our list. The Gray Street buffet server fits perfectly in this space and has all the storage capacity that we need. The Candlestick Lamp almost looks as if it's an extension of the buffet server. It's an ideal match for the furniture and the decor. The rugs were another labored decision. Raymour & Flanigan has a fabulous selection of area rugs. So many of them would have matched the dining room set perfectly, but in the end we chose the sisal rug and runner. While I couldn't wait to move everything out of the room, I had a dilemma with my "office". I was using a corner of this space as my office, and now I wasn't sure where to relocate my desk. It wasn't a tough decision. We decided that we'd relocate my office to the nook that had been our eat-in kitchen area. It was the perfect sized room, and since we were no longer going to need our kitchen table, we decided to convert the space to my office area. The inspiration for the room was the throw rug, which I had previously owned. 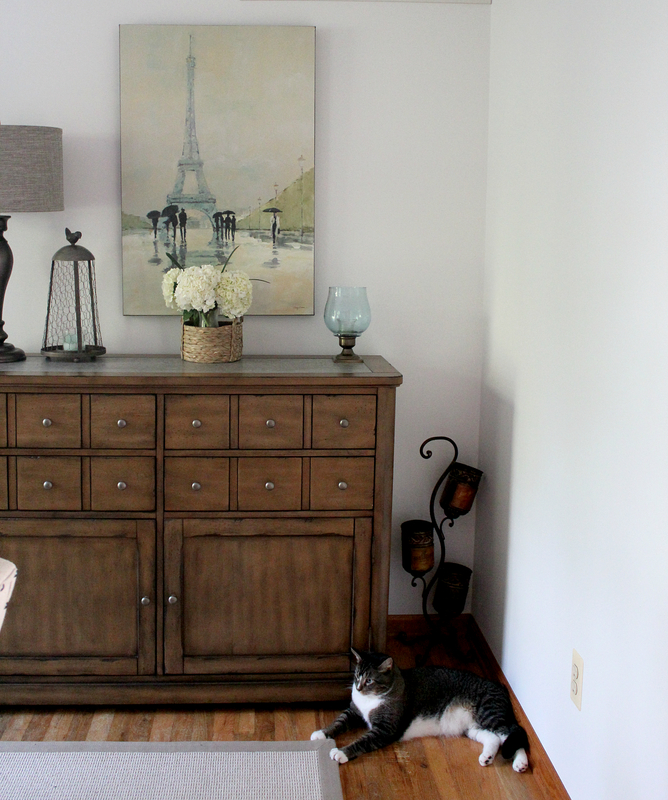 I added the Beacon Writing Desk from Raymour & Flanigan. I wanted a white desk that had both a contemporary and a classic flair, and the Beacon Desk had both. I added an office chair with a criss cross back, and two conference chairs which are the Annie dining chair from Raymour & Flanigan. 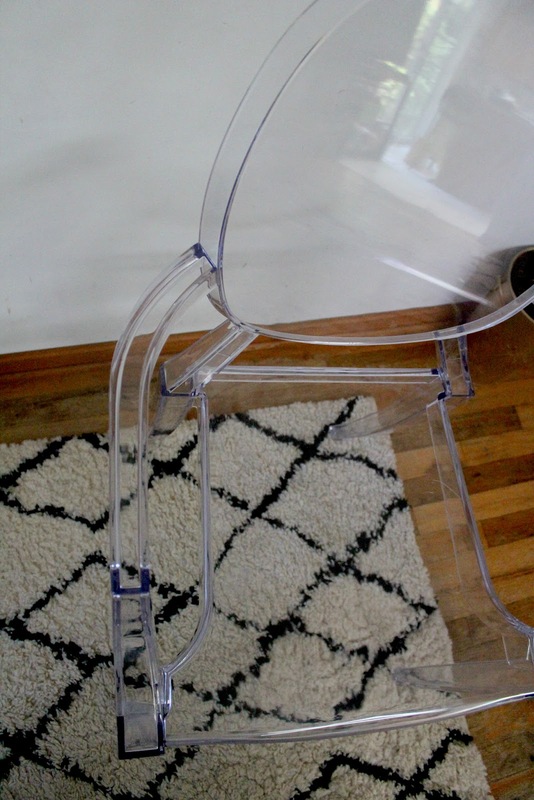 I've wanted a ghost chair for a long time, and I originally had chosen one for my desk chair, but I didn't think it would be ergonomic. 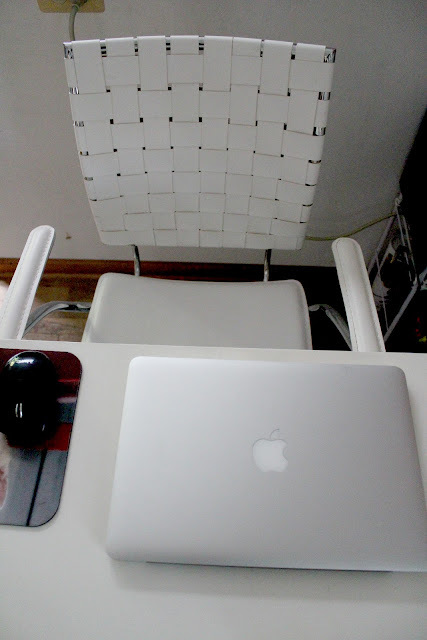 The Annie chairs are surprisingly comfortable although I opted for a traditional office chair for my desk. Because the office nook is small, I kept the furniture to a minimum. 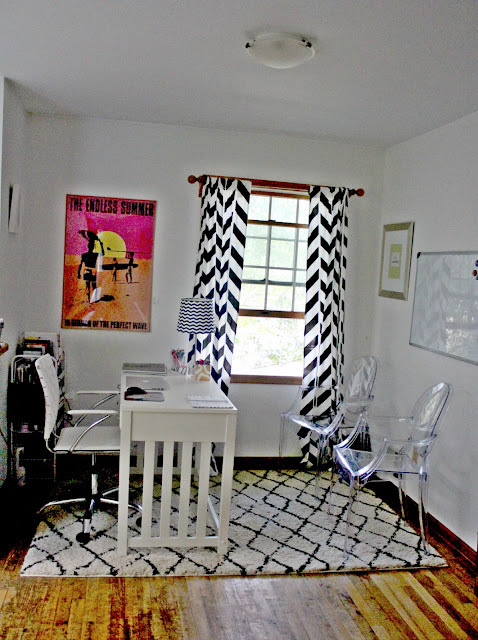 Plus, since it's a home office, I didn't want to clutter it with a lot of unnecessary pieces. It has the essential pieces of furniture, and all of it fits perfectly in the space. Gorgeous, right?! I am over the moon. I can't stop looking at and walking around in the rooms. Someone pinch me. Seriously. 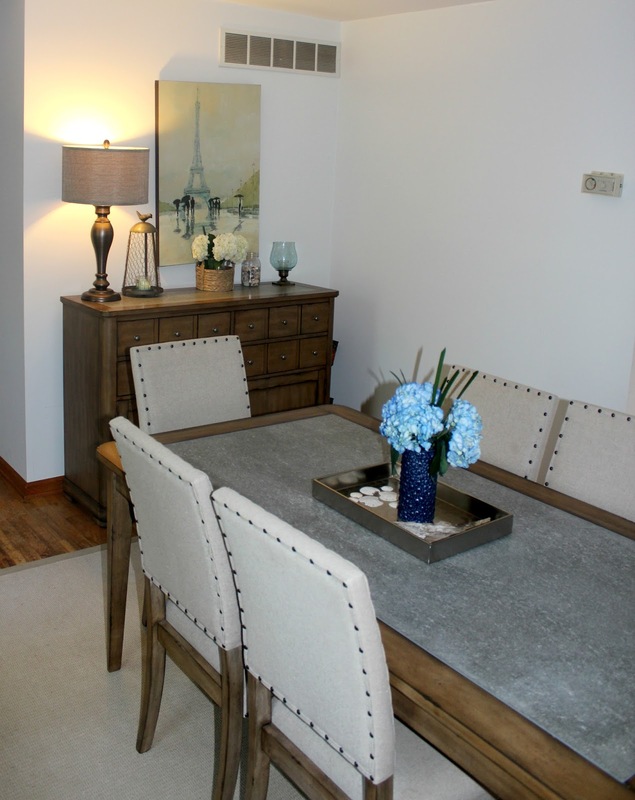 We get so many compliments on both rooms and the quality of the furniture. We placed our furniture order on a Sunday, and by the following Wednesday the delivery truck was parked in our driveway unloading our furniture. Most Raymour & Flanigan deliveries are guaranteed within three days, but of course, if you need more time, Raymour & Flanigan will certainly accommodate you. The delivery personnel were very professional and careful. They were mindful of our walls and doorways. They set everything up and removed all the protective covering from the furniture and disposed of it properly. 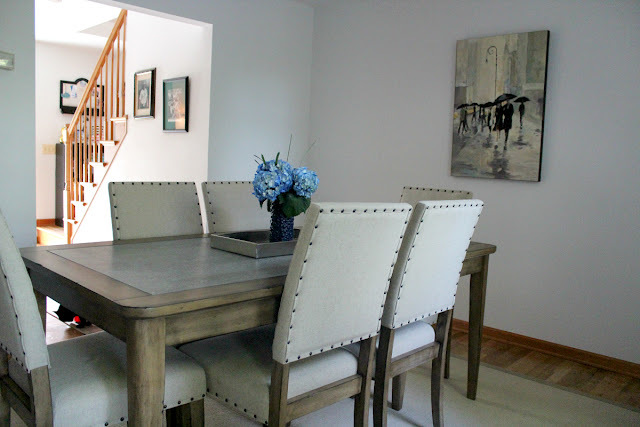 From the moment we walked into the Brick, New Jersey location to the first moment we sat down at our new dining room table, our furniture buying experience with Raymour & Flanigan was an absolute pleasure. Raymour & Flanigan generously provided me with a gift card to facilitate my shopping experience and this review. All opinions, as always, are my own and are based on my own experience.